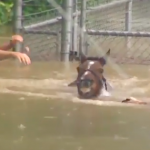 Check out Kasey Hayes on Mississippi Hippy: Ending his unridden streak in 2014! Imagine Andre The giant as a bull- This is Mississippi Hippy! The average bucking bull is 1400 to 1800 lbs- Hippy is a carefree 2400 lbs! Mississippi Hippy is not only close to 2,400 pounds, but he stands 6-foot-4 inches to his hump! 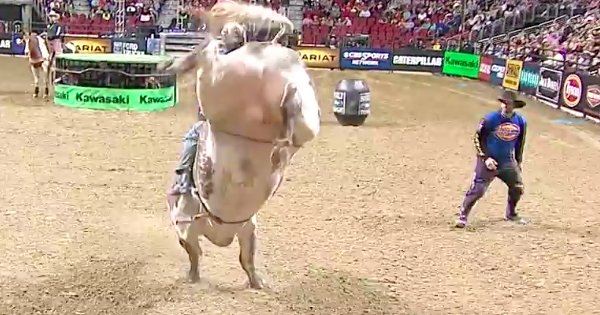 Mississippi Hippy retires with an average bull score of 43.78 points. He also competed at the last four Built Ford Tough World Finals. This bull has a huge fan club and it’s easy to love this super sized teddy bear of a bull. This ride is a famous ride for PBR fans and those that follow bull riding. 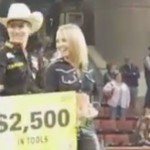 It is from the BFTS championship round of the 2014 Des Moines Invitational in Des Moines, Iowa. Mississippi Hippy had bucked off 23 consecutive riders on the BFTS to begin his career before Hayes rode him for 88.5 points. Any cowboy to last 8 seconds on this bovine truck of a specimen -instantly becomes their defining moment. Only 3 PBR riders ever rode Mississippi Hippy to 8 secs In BFTS: Kasey Hayes, Eduardo Aparecido,and Nevada Newman. Hayes remembers how much of a struggle it was to find any room for his feet inside the bucking chutes. Hippy was forced to retire due to a hip injury sustained last week at Iron cowboy. Mississippi Hippy your large lovable presence will be missed and you left a large footprint of remarkable grace and beauty. Share with those who love Larger than Life Bulls! 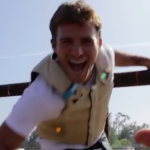 (VIDEO) AWESOME BULL RIDING MUSIC VIDEO SONG “BULL RIDER” BY DOUG WELBORN-REALLY FUN! 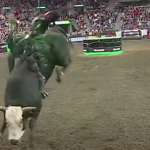 (VIDEO) PBR BULL RIDER ROSS COLEMAN KNOCKED UNCONSCIOUS IN THE CHUTES! 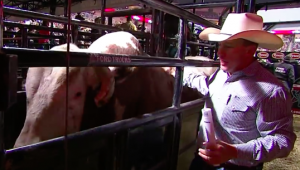 (VIDEO) EMOTIONAL FOOTAGE AND LANE FROST TRIBUTE-WATCH TUF HEDEMAN REFLECT ON HIS LIFE WITH LANE FROST! 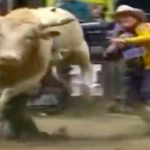 (VIDEO) FOOTAGE OF TOP 10 BULL RIDES OF 2015 FROM PBR!